This will be a day long remembered. For the duration of the week-end, let your inner nerd reign free over your shopping impulses and save $20 on orders of $100 and more on Star Wars products at Thinkgeek. Always in motion is the future as well as our page dedicated to Thinkgeek’s deals and promotions. Show off your ultimate support for the epic franchise with a Star Wars car wrap, such as the Darth Vader one featured on the right. Making it easy to spot your car in a crowded parking lot, it might just secure you that coveted employee of the month parking spot as well due to its pure awesomeness. The force is strong with this one! 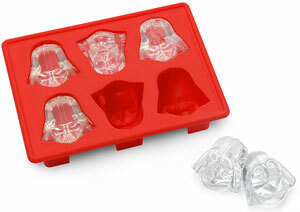 On a smaller scale, the Darth Vader ice cube tray would definitely liven any party. Not only that, but I’ve also got a very good feeling about the possibilities: ice or candies in the shape of Vader’s helmet. With Mother’s Day right around the corner, be sure to also include a gift for her from Thinkgeek’s Mother’s Day Gift Center with gift packs for any type of mom from the caffeinated mom, the gamer mom, the n00b mom and a couple others. Will you use the force?